The European developed and built Village Life spring rebound inertia or water oscillation hand-pumps for boreholes in developing countries were first formally presented during the International Water Resources Association's world congress held in Brussels from 9th-15th of June, 1985. They represented a major technological break-through which might, but for political factors and vested interest, have had a profound influence on the International Drinking Water Supply and Sanitation Decade 1981-1990 and thereafter. They were one of the very few genuine technological advances to have come out of the International Drinking Water Decade and undoubtedly present the most fascinating development in hand-pumping last century. Spring rebound inertia pumping allows for extreme simplicity of pump construction, the total elimination of all organs of transmission and parts in relative movement below ground level, extreme facility of installation and maintenance, particularly wide possibilities of application, maximum security of water supply including the use of multiple independent unit installations and excellent resistance to sand, adaptability to local social and cultural structures, universal use especially by children, low global long-term costs of operation, village level operation and maintenance (although Village Life pumps were already post-VLOM at their conception) and real prospects for local manufacture of pumps and/or spare parts. They are particularly suited to use in development aid projects because they have a low global long-term cost per litre of water pumped compared with most other types of hand-pump currently available on the market, and therefore yield a very low recurrent maintenance cost onus for beneficiary communities. They eliminate at origin the insurmountable technical problems inherent in pumps traditionally used for the supply of safe drinking water to poorer communities throughout the world. The difference between spring rebound inertia (water oscillation) pumps and traditional pumps is that spring rebound inertia pumps, exploiting the characteristics of the oscillatory cycles of the water column in the feed pipe to obtain their pumping effect, use a principle of physics for their operation, whereas rod-type pumps, for instance, use a mechanical device. This fundamental innovation carries with it a number of consequences such as to revolutionise hand-pumping in developing countries. The following are some of them. What exactly is a spring rebound inertia hand-pump? It is a pump comprising first a lever system attached to an upper pump body containing an above-ground piston or plunger, secondly a lower chamber closed at the bottom by a no-return valve and containing a series of elastic balls or elements called ovoids (the same pump can be used at all depths by varying the number of these balls or ovoids), and thirdly a single 1 1/4" flexible 16PN polyethylene pipe joining the upper pump to the lower chamber by means of rapid couplings. The lever and the upper pump form a first oscillating group, while the balls or ovoids in the lower chamber together with the water in the feed pipe comprise a second oscillating system. The two oscillating groups have to be put into resonance with one another for the pumping action to take place. After installation once-only initial priming is needed to fill the system with water. The lever system is then moved downwards and upwards more or less as with other types of lever pump. 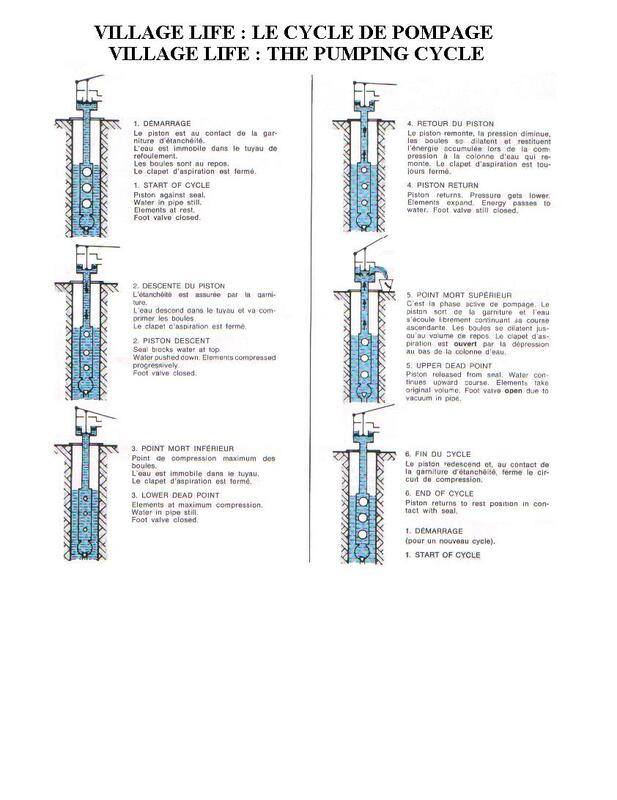 On the downwards stroke, the energy applied is transmitted from the lever system to the above-ground piston (or plunger) and thence to the mass of water present in the column. The water in turn transfers the energy to the special elastic elements in the lower chamber. These, contracting, store the energy in the form of potential elastic energy. At the lower dead point or close of the (variable - the stroke can finish at any point) downwards stroke, the elastic elements spring back to their original volume, returning the energy stored to the column of water in the feed pipe. The kinetic energy of the water is such that, as it tends by inertia to continue its upwards movement in the feed pipe, if the piston frees itself from its seal, a quantity of water simply spills out of the pipe at the top, while at the same time a small vacuum is created at the bottom of the feed pipe so that the foot valve opens and the same quantity of water is sucked into the lower chamber, thus concluding the pumping cycle. The actual pumping is thus done by the water itself as it oscillates in the feed pipe. As spring rebound inertia pumps are dynamic machines, the number of parameters which can be applied is too numerous to map out in graph form. The following drawings are based on an average for one operator, average capacity with two operators, and maximum capacity with one or two operators. Although these pumps are hydraulic units with a double passage of water along the feed pipe, their efficiency has been independently measured as being up to 50%. While this may be slightly lower than that of some other hand-pumps operating within a narrow application band and often for a limited period of time (wear and tear of parts makes the efficiency of traditional pumps unstable), efficiency is, as the notes set out below convincingly demonstrate, only one aspect of professional hand-pumping and by no means the most important one. Each user can operate the pump according to his own desires, provided he adopts the correct RHYTHM of pumping for the installation in question, which is designed to be about 80 strokes per minute, which in turn is the rate of the human heart-beat. Observation of installations in Africa has indicated that users adapt pumping automatically to their requirements. If they require a small amount of water to fill a container (15-20 litres), they will tend to "sprint", using longer strokes. Children, on the other hand, who are typically the best users, will tend to use shorter strokes and take, say, 30 seconds longer to fill the same container. Village Life pumps can be installed vertically and/or horizontally even with bends in the single length of feed pipe used, and they are accordingly entirely insensitive to shoddily drilled holes and can be operated from any source of water. Problems with the installation and maintenance of rod pumps which require a perfectly vertical hole are too well known to call for analysis here. Village Life pumps have no parts in relative movement below ground level, and therefore they are much less sensitive to sand than is the case with other pumps where sand and impurities collect at the bottom of the lower cylinder and greatly aggravate wear and tear on valves and seals etc calling for frequent removal of the system from the bore-holes and the replacement of parts, with all of the implications notoriously connected with traditional pumps in this respect. Village Life pumps use one single length of 1 1/4" 16PN flexible polyethylene feed pipe with a nominal pressure rating of 16 bar for each pumping unit. These pipes, fitted to the lower cylinder and to the upper pump by means of simple rapid couplings, are normally continuous in length, so that the pumps can be installed and/or pulled in the space of a few minutes, whereas traditional pumps often present long, difficult, and heavy installation procedures because of the need to assemble and dismantle rods and pipes, where this does not turn out to be practically impossible. Repeated frequent assembly and dismantling of rods and pipes tends in fact to ruin the threading and make removal for maintenance highly problematic. The single feed pipe means that several Village Life pumps can where appropriate be installed in the one 110mm ID (or larger) bore-hole, thereby better exploiting the investment in the bore-hole and further increasing the security of water supply. In larger communities, and provided the capacity of the bore-hole so permits, this feature can substantially reduce the number of bore-holes which have to be drilled, and therefore the global cost of rural water supply projects to the point where the Village Life pumps may even have a negative value where the value of the cost-savings in bore-holes is greater than the cost of the pumps. As all other units (double, triple and even quadruple pump groups) fit on the same foundation bolts as the single unit version, the fact that several pumps fit down the same bore-hole means that the principle of progressive investment can be applied where bore-hole capacities so permit. A village can receive a single unit pump in a first phase, and thereafter substitute the single unit with a double pump group (the original pump would be installed elsewhere) and so on to adapt without further investment in bore-holes to population increases and to increases in water requirements accompanying an improvement of the standard of living of the community. Installation and maintenance times and costs increase with rod-type pumps with the length of the rods and pipes, and therefore with the depth of the water level in the bore-holes, while at the same time the weight, the inertia, and the attrition of the rods increases, so that the work required to pump increases more then proportionately with the depth of the installation. This means that the use of rod-type pumps, theoretically utilisable at depths of more than 25m. is not in such cases advisable in practice. While such conclusion may not have been widely publicised, partly because of the considerable vested interests involved, it is a fact that the search for alternative systems of hand pumping was undertaken world-wide for this reason. Water oscillation or spring rebound inertia pumps completely eliminate at origin these problems. They become progressively ever more attractive with respect to traditional pumps the deeper the level of water in the borehole (up to 45-50m! !, for deeper boreholes go solar - see Solar Spring pumps), the more isolated the location, the more intensive the use, and the more aggressive the water. Installation and withdrawal times do not vary with depth and there are no rods or riser pipes to get rusty or move. Due to the automatic return of the column of water in the feed pipe of spring rebound inertia pumps, their lever system returns to its upper dead point on its own. This phenomenon has made it possible to adopt the world's first combined foot and hand system for lever pumps and thereby to optimise the use of the operator's energy and enable him to obtain good capacities even where pumping continuously for extended periods. A traditional handle system enables the user to exploit about 40% of his potential force without giving him the possibility of alternating the muscles in play. The combined hand and foot lever system used for Village Life pumps not only allows for the exploitation of roughly 70% of the potential force available, but assures the possibility of changing over from one leg to the other as well so as to obtain a "long distance running effect". Furthermore, water oscillation pumps can thus be operated either by hand and/or by foot. They can also be operated by two or more persons together should this be considered advantageous by the users involved. Traditional pumps are basically constant force pumps in the sense that a certain force is required to be able to move the handle in a given situation to raise a constant amount of water, and the same force is required to continue moving it, while there is a certain direct relationship between a stroke and the volume of water pumped so that the variability in the volume of water pumped tends to be determined by the number of strokes made. Water oscillation pumps profoundly modify hand pumping in this respect, as practically everything in a water oscillation pump is variable, and above all, THE AMOUNT OF FORCE APPLIED, and therefore the length of the stroke and the volume of water pumped with each stroke. Water oscillation pumps are truly dynamic machines which can be used by the very young, the very old, the fit, and the sick, according to their physical capabilities, the time they have available, the amount of water they have to pump, and their mood of the moment. The use of a water oscillation pump is therefore in these respects similar to that of another excellent dynamic machine : the bicycle. Rhythmic extremely light limited strokes will still yield water. Naturally there is a relationship between the force applied on any given stroke and the amount of water pumped, so that longer (not quicker) strokes will normally produce more water. The dynamic nature of the Village Life spring rebound inertia pumps makes them especially suitable for use by women and children, who are the ones who usually have to do the pumping. Children can use the pumps at any depth for which they are recommended, while current models have been designed in such a way as to be more efficient with lower force input. The installation and maintenance costs for Village Life pumps are such as to yield a long term cost per litre of water pumped which is only a fraction of that of other hand-pumps available on the market. Full and detailed costs projections indicating a global long-term cost per litre of water have been published. Excluding amortisation of the initial investment costs for purchase and installation, amortisation of the costs of the bore-hole, and excluding eventual associated health and sanitation costs, but including all costs to the recurrent charge of the villages such as labour, spare parts, amortisation of spare parts so as to bring the pump back to new working condition at the close of each ten years' period, the projection comes to US$ 0.000045 per litre. Assuming 8 hours' effective work per day (15-16 hours' use) and an average of 12 litres per minute, each pumping unit can give 28,8 litres of water per day to each person in a village of 200 people. The overall annual cost per capita to the local population is in this case indicated at US$ 0,50, which enables a fund to be built up over the first few years when costs are practically nil, to meet the costs over subsequent years . These are the "long term" costs that manufacturers and most operators have generally preferred to ignore, as, if they were not falsified, they would not have been considered suitable for publication. Indications for spring rebound inertia pumps are available for 1,2,3,5 and 10 years. While the initial purchase cost (investment input) of a European built stainless steel water oscillation pump is higher than that of a traditional pump made, say, in India, the global installed cost shows a lesser difference, while if traditional rod-pumps have to be supplied with stainless steel rods and riser pipes, the cost of the traditional pump installed may be considerably higher than that of an installed water oscillation pump without bringing any marked improvement in real terms to the overall maintenance costs which generally finish up as a recurrent charge on the village, which cannot afford them. This gives rise to a fundamental political consideration : the clear need for operators (especially local governments) to seek the initial investment (pumps plus spare parts networks) which will yield the lowest recurrent cost onus on the beneficiary communities after installation, instead of choosing the pump which APPEARS to be cheaper. The only true measure of evaluating a hand-pump is how much it costs per litre of water effectively pumped over a long period of time, say 10 or 20 years. The initial purchase price of the pump has relatively little to do with such costs. There are hand-pumps on the market which have cost more than their original purchase price every year for maintenance, and some of these may even have to be replaced after just a few years. Yet another revolutionary aspect of Village Life system spring rebound inertia pumps, is that certain parts, typically subject to wear and tear over a long period, can be re-utilised several times. For instance the two (upper and lower) bronze piston guides and the brass lever guide plaques and the nylon lever guides (which are the parts in contact respectively with the above-ground piston and the lever group) can be rotated, then inverted, then interchanged with one another and can therefore be re-utilised from four to six times. In theory, the most critical parts of a spring rebound inertia pump are the free-floating elastic elements placed in a chamber at the bottom of the bore-hole above a no-return valve. For this reason, the springs have been pluralised. Village Life pumps are supplied as standard with eight elements. A pump with eight elements can work with seven, six, five, four, or even with just one element. The reduction in the number of working elements makes the pumping stroke harder and shorter, but the pump continues to function. For this reason, it is technically impossible for a spring rebound inertia pump to stop operating between periodic preventive maintenance visits, so that loss of use of the pumping system and of the borehole can be reduced to 0%. Spring rebound inertia pumps do not necessarily require skilled labour or particular margins of tolerance for their manufacture. Traditional rod-type pumps are more complex and delicate because of the presence of transmission organs. They require more expert labour and, above all, closer quality control. While European built spring rebound inertia pumps are built entirely from stainless steel, there is wide potential for manufacture in other areas in accordance with locally available materials and technology. The Village Life pumps have been designed in such a way that parts subject to wear and tear over a long period can, in emergencies, be replaced at village level using recovery materials such as used motor vehicle tyre tubes (foot valve rubber) or local leather (above-ground piston seal). The only tool needed is a knife or a pair of scissors. Water oscillation pumps require no lubrication or systematic maintenance, and do not generally break down even when they need attention. Their simplicity has enabled the developers to arrive at a level of robustness and resistance as to be able to offer a serious guarantee against breakdown due to wear and tear of any part for a period of 12 months from the date of installation however intensive the use may be. In this sense, the Village Life pumps were not only "post-VLOM" at their inception, but also "post-plastic". Village Life system spring rebound inertia pumps entirely eliminated at origin at their inception in the early 1980's all problems relating to the use of plastic elements below ground, which have for the last fifteen years absorbed such a large part of the attention of researchers in official spheres. The single continuous length of flexible polyethylene feed pipe used with spring rebound inertia pumps was introduced many years before official circles even started trying to adapt plastic feed pipes for use with traditional rod type pumps, and is the most practical solution since the single feed pipe can bend, does not need vertical boreholes, and has no joints which have to be held firm.